PHYTEC Technologie Holding AG will remain a family-owned business over the coming decades. An early succession plan for board positions ensures continuity and confidence for the future of the company. As announced during a company ceremony, Daniel Neubecker - son of founder Karl Neubecker - and his brother-in-law, Christian Waidner, will be appointed to the Board of Directors as of June 2024 in addition to Michael Mitezki and Bodo Huber. The current and future members of the Board of Direcrtors jointly hold the majority of the voting rights for the Holding. Daniel Neubecker and Christian Waidner are currently employed at PHYTEC Messtechnik GmbH, the largest entity within the PHYTEC Holding, and are already involved in overall company strategy. Bodo Huber, who has managed the company for over 20 years alongside CEO Michael Mitezki, has been appointed to the Board of Directors of the PHYTEC Holding and will also hold the title of Technical Chief Executive Officer at PHYTEC Messtechnik. 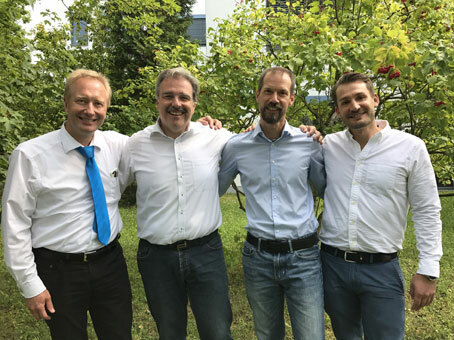 Both Mr. Mitezki and Mr. Huber will serve on the Board of Directors of the PHYTEC Technologie Holding AG for another twelve years before transferring directorship responsibilities to Mr. Neubecker and Mr. Waidner. Our range of products and services includes System on Modules, Single Board Computers and custom products as well as housing design and assembly for turnkey solutions. PHYTEC also offers solutions for Internet of Things and Embedded Imaging as well as hardware specific software. The majority family-owned enterprise PHYTEC employs more than 350 people in 5 locations worldwide. We develop and also produce at our corporate headquarters in Mainz, Germany. This has been a conscious decision. All main departments such as purchasing, development, manufacturing, logistics, sales, marketing, and even bookkeeping are located at headquarters. PHYTEC's advantage is increased flexibility due to high level of communication between development and manufacturing teams. Our customers are at the center of our business. Throughout all that, PHYTEC is a still a family business today. We place a strong emphasis on employee satisfaction, a healthy company growth as well as socially responsible corporate management. PHYTEC fosters a flat organizational hierarchy as well as an open book management approach that is part of our lean management philosophy. Staff turnover is very low, which attests to our corporate culture. As a global family business, we take responsibility for all stakeholders. With no debt and an equity ratio of over 68% (in 2013), PHYTEC is financially independent and remains a majority family-owned enterprise with minority ownership shares held by the managers of our operational divisions. This safeguards our success, renders PHYTEC a highly stable employer, and makes us a reliable and crisis-proof partner for our customers. Even during the economic turmoil of recent years, we have demonstrated that our goals and values are long-term and provided superior short-term stability. Our motivated employees anticipate market trends, find innovative solutions, and secure decisive competitive advantages for our customers as well as PHYTEC. Optimized use of the newest embedded technology advances leads to prolonged product life-cycles and maximized returns on development investments. 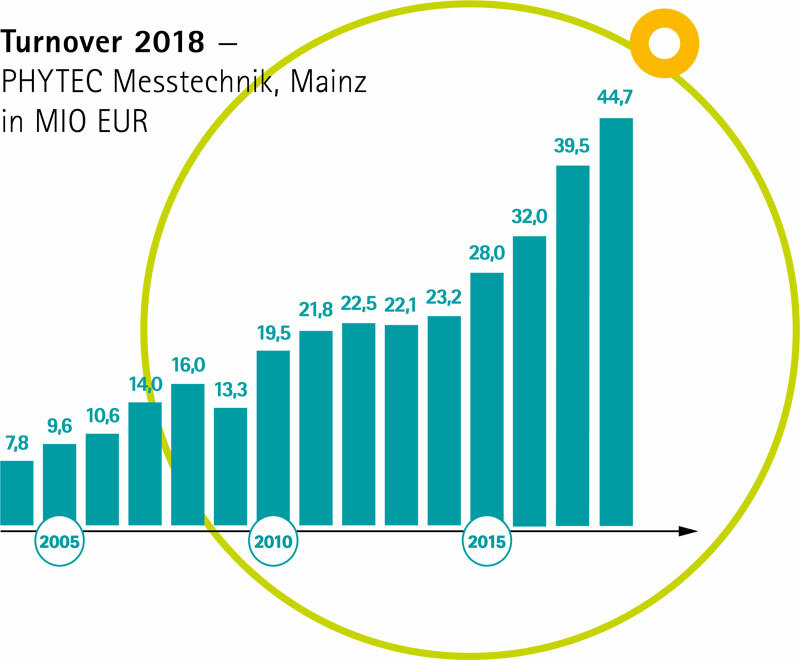 PHYTEC has doubled its overall financial performance over the last five years and achieved global sales of around 65 Million Euros in 2018. For 2019, we expect double-digit sales growth at the Mainz Headquarters.